I\’m not interested in financing with my bank. What options do you offer? We have partnered with a major Canadian bank to facilitate our projects. We can help you fill out the forms and get it to the right people. Approvals are usually returned in a couple of days. Currently the rates for these unsecured loans are 6.99%. There are no discharge fees so if you need a temporary loan until your mortgage is up for renewal than this may be a good fit otherwise check with your own bank. Where’s the best place to finance my system? You will absolutely get the best interest rate if you pursue a secured Line Of Credit with your own bank. I would like to install solar, what are my options? In Ontario there are four different ways you can use solar. MicroFIT – This is a program offered by the Ontario government where if you put solar panels on your roof they will guarantee to buy as much power as you produce for the next 20 years at a set rate. The 20 year rate for people who lock in this year is 31.1 for systems under 6kW and 28.8 cents a kWh for systems between 6kW and 10kW. This has been the most popular program for the past 7 years. Net Metering – This is the simplest program to understand. You generate the power and you use it. Excess power can be stored in the grid for up to 12 months. Off-Grid – This type of system is used when there is no grid connection available. This is typically used for remote sites. Grid-interactive Net Zero – This is a hybrid of net-metering and off-grid. It is typically used when the utility will not allow a standard grid-tie system. Under net-metering, what parts of my bill do I get credited for? Delivery? You will be credited for everything except the flat rate distribution fee. You will be credited back for delivery, regulatory, debt retirement and any other charges that are based on how many kWh’s you use. You will still be stuck with a bill of about $20 to $40 a month. Can I completely eliminate by hydro bill with net-metering? Almost but not quite. There is a small part of your bill usually referred to as the “flat rate distribution fee” or something similar which you will have to pay regardless if you use any power or not. This is an administration fee for being connected to the hydro companies network and is usually between $20 and $40 per month. Under net-metering, will I be credited for power at the same rate the utility charges me for it? This all depends on the utility. All utilities have different billing structures. In most cases there is a small difference. One example is that they will charge you HST but will not credit it back if you do not have an HST number which most home owners do not have. For the portion of the power you use as you generate it, you will save 100% of the cost of that power. How important is the efficiency of the solar panels that I buy? The efficiency of a solar panel is its ability to convert solar energy into power. A panel that has an efficiency of 15% converts 15% of the solar energy that falls on it into power. There is a great deal of hype about how efficient one panel is over another. What efficiency translates into in real terms is how many square feet does it take to generate a certain amount of power, the more efficient the panel the less space they take up. If you have limited roof area then a more efficient panel will allow you to put more kW’s on your roof and may be more cost effective. The downside though, is that the more efficient a panel is, the more it will cost per watt. It may be possible to buy 30% efficient panels but they will cost twice as much as 17% panels and therefore will not make sense for most people. On the other hand if we use panels that are too inefficient like thin film, our mounting costs are going to be more expensive since we will be mounting twice as many square feet of panels. Panel efficiency is just one of many factors that go into delivering a system that is optimized for the maximum ROI (return on investment), which is always our goal. I would really like to get a solar system but I can only afford 1 or 2 panels. Is it worth it? Probably not. 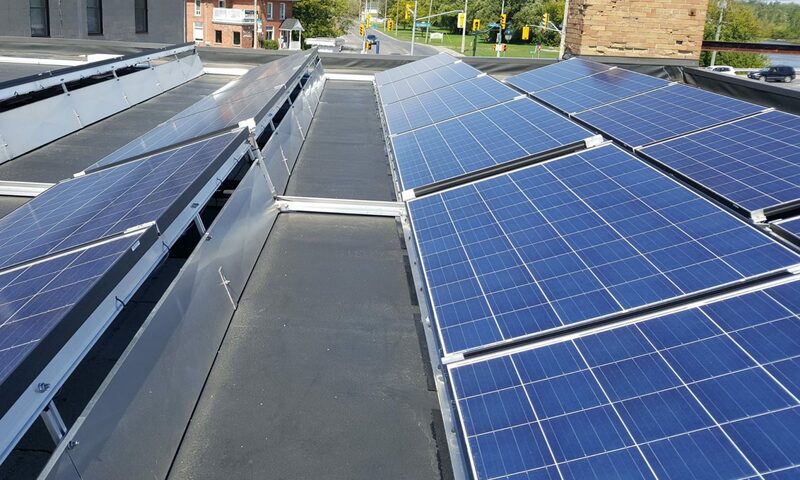 With a grid-tied solar system the first panel that goes on the roof will probably cost about $7,000 due to all the permits, fees and other overhead costs. There are a lot of costs that are the same regardless if you are installing one panel or fifty. Every panel that goes on the roof after the first one significantly reduces the price per panel and your return on investment. Are there any tax breaks or subsidies for solar in Ontario? Sadly there are virtually no incentives or subsidies for solar in Ontario. This is at a time where every other form of energy is being subsidized by 25% by the Ontario Fair Hydro Act. For businesses there is the opportunity for accelerated depreciation but that is it. Your payments will vary depending on how sunny it is through the month and on seasonal differences. Obviously we get more sun during long clear summer days than we do during short overcast winter days. On average you would generate about 12,500kWh’s per year from a standard 10kW system. This is what the average household consumes in Ontario. In most cases you can completely eliminate your hydro bill forever or at least 30 years. What is the maximum amount of electricity I can generate for my home? There is no real limit on the total kWh’s that you can generate but you can only put 10kW back into the grid at any one time. Can I put panels on two sides of my roof? Absolutely, in fact we can show you installations where we have panels on four sides or even more. Depending on the slope, a roof plane facing due West or due East will only lose 13% power over one that is facing due South. We have real world examples of panels facing North that only lose about 25% of their power over a South facing roof. In some situations an East/West can yield more output than a South facing roof. Do use micro-inverters on your solar systems? Micro-inverters, like acid washed jeans, seemed like a good idea at the time but in retrospect, not so much. We installed well over 5,000 Enphase micro-inverters that were supposed to have only one failure per year out of every 330 units. In reality the failure rate was as high as 1 in 8 per year and we have now replaced well over a thousand of these units. We have a dozen or so RMA units arrive every week and probably will for the conceivable future. To make matters worse the company stopped honouring their parts and labour warranty, they still replace the part for free but the home owner has to pick up the installation cost. Because the inverter is located on the roof, under the panel it is not an easy thing to access. There are other better options if you want to have panel level optimization and monitoring. I have heard that solar panels are going to drop in price in the future, should I wait? It is true that the price of panels have dropped drastically and there is still some room to go. The price of panels have come down so much that it is not the most expensive part of a solar system. In recent years the rules have changed and the installation cost have gone up by more than the price of panels have come down. We have had to add arc fault protection, rapid shutdown, squirrel guard and other equipment for compliance reasons. This has added thousands of dollars to the price of an install. Other changes such as anti-dumping laws and increase import fees have made Canadian panels more expensive than in the past. So, while the price of panels may go down, it doesn’t mean it will get cheaper to install. I live on a farm. Is that okay? Farm buildings are fantastic for roof-mounted systems. Large dairy or poultry operations may be able to install much larger systems too. Yes and No. From a technical standpoint, there are few areas in Southern Ontario that are not viable for solar energy. From a practical standpoint it is possible to be denied a connection by your hydro company due to lack of capacity on your local line. If too many people on your line segment install solar you will be denied. Connections are awarded on a first come, first served basis. The only places where we have this issue is in Hydro One territory and even then it only happens about 10% of the time. How do you find dealing with the Local Electrical Distrbution Company (LDC)? Every power distribution company is different. The people at Halton Hills Hydro as well as Milton Hydro have been wonderfully supportive and we love working with them. Hydro One has also been very helpful to our efforts. At this time, most hydro companies in Ontario have had enough experience that the process is a smooth one. Will I have electricity when the grid power goes down? The short answer is, probably not. The typical grid-tied system is designed to turn off if the grid goes down for safety reasons. That being said there are ways to have power when the grid goes down but honestly a generator would be a cheaper solution. Can I install my solar panels on the ground or on one of those poles? Unfortunately the rules have changed recently so that we are only allowed to install solar panels on rooftops. You may see a lot of solar installed on the ground or on dual axis trackers but these were installed before the rules changed. Solar panels must be installed on a structure that was not built to just hold solar. In other words the building that the panels are installed on has to have a real purpose for being there other than solar. It depends on the size of installation, the complexity of your roof, and any other factors around your home. However, you can figure approximately 2 to 3 days for the panel install and another day for the electricians. How long does solar equipment last? Manufacturer warranties for solar panels are typically 25 years. Inverters are warrantied for 10 to 20 years with another 5 or 10 years optional. From what we have seen from installations in Europe and California, solar panels should actually last about 40 years. Do you account for wind? Yes, it’s a design consideration. We have never had a panel come off any of our installs. We had one installation that suffered an almost direct hit by a tornado (the building 10′ away was missing) and not a single panel left the roof. Uplift forces are more of a factor than weight when it comes to engineering. Will birds or squirrels cause problems with my solar installation? Birds can white wash your panels but they don’t really cause any serious damage. Squirrels on the other hand can nest under the panels and they have the annoying habit of chewing everything and anything. New ESA rules require us to install metal squirrel guards on certain installations and if it is a concern we can install it even if the rules do not require it. My roof is pointing directly West (90º off South), will it still work? Yes, see question above. A typical roof that faces directly West or directly East will still earn up to 87% as much as the same roof pointed directly South. Who owns your business? Is it a Canadian-owned business? Solar Direct Canada is owned by Ray Jarvis of Acton, Ontario. And, indeed, he is Canadian. What\’s different about your company and the system they install? I will start by stating up front: We are not the cheapest system on the market. We can’t be. There is always someone out there that is willing to cut corners to provide a cheaper system. And we know, from fixing competitor systems, exactly what those corners are. If you don’t mind a leaky roof, if you don’t mind poor efficiency (and less revenue), if you don’t mind lack of warranty, then you’re fine with competitor systems. How can they afford to do this? Because they are usually only in business for a year or two and once the warranty issues pile up they close up shop. Bad for you but good for us because we get a lot of work fixing those systems. Go spend less money and be content. As for us, we install a premium system. Period. If you want a KIA, go buy a KIA. If you want a BMW, come to us. I don’t know how else to state this. Of course. In fact, if any solar power company cannot provide you a list of 20 or 30 customer references that you can pick from, stay clear. How many solar installs has your company done? To be honest we have lost count but between 400 and 500 installations would be our best guess. Even after the experience of that many installs we still learn new things from time to time. We were incorporated in March 1990 so we have now been in business for 28 years. Solar has been our primary focus for the past 10 years. Our shop and office is located in Acton, Ontario. Acton is just North of Milton and about 45 minutes NW of Toronto. We like to operate locally but we do installations across the province, from Tobermory, to Windsor, to Ottawa, to Sault Saint Marie. We will install anywhere. We have supplied equipment and expertise for projects in North America, South America, Africa and the Caribbean. Our own team of installers does all of our installs. Unlike some solar brokers we do not subcontract out any of our installations, this way we have better control over the quality and timing of our installs. All of our installers have installed at least a hundred systems before. If you ever have a problem in the future there will be no finger pointing. We installed it, we will stand behind it. Who does your electrical work? Are they ESA certified? Most of our installs are done by B&T Electric. They are ESA certified master electricians and have connected hundreds of solar projects for us. What does your price cover? Is it really a turnkey price? Everything and yes. You will not incure any costs over and above what is agreed upon on your purchase order. Our price includes the cost of ESA inspections, utility connection fees, building permits and anything else necessary to install the system. We have been in business since March 1990 so we have been in business for 26 years. We haven’t done solar for that long, only the past 10 years. When does off-grid make sense? Off-grid makes sense if you don’t currently have a connection to the grid. Bringing in a new service can be expensive, especially in cottage country or any rural areas. We have seen Hydro One charge prices of $70,000 to $200,000 to install new services. In this case it makes a lot of sense. We can build a real nice off-grid system for well less than those numbers. If you have a connection to the grid and you want to generate your own power then net-metering is a much better choice. Grid-interactive Net Zero – This option is used when you have a grid connection but the utililty will not let you connect a solar system to it. It is more expensive than net-metering or microFIT but it has the added bonus that you will have power when the grid is down. Off-grid – This is only suitable if there is no grid connection available. It is the most expensive option. MicroFIT – If you do not have a load account at the site this is the only choice. This option has the highest initial rate of return but overall the rate of return is lower than net-metering. In Ontario there are three different ways you can use solar. Microfit (no longer available as of December 2017) – This was a program offered by the Ontario government where if you put solar panels on your roof they would guarantee to buy as much power as you produce for the next 20 years at a set rate. This program was quite popular but is no longer offered. Will generating solar power reduce the use of nuclear power in Ontario? No, but it will reduce the use of natural gas. The output of nuclear power stations is not adjustable. They are always running at the same rate. If there is excess power from solar, they will throttle back the gas generation plants first. Does the manufacturer of solar panels release greenhouse gases? Not directly but if we were to factor in the energy it took to make the panel in all the different phases of the manufacturing process, it has been estimated that solar energy releases 25 to 32 g/kWh. This compares favorably to coal which releases 960g/kWh or even clean burning natural gas which releases 590g/kWh. The only technology that releases less g/kWh would be wind turbines or in some cases Sourcehydroelectricity. How much energy is used to manufacture a solar panel, is it worth it? I heard there is a new breakthrough in solar technology coming, should I wait? It may come as a surprise to many people but solar photovoltaic cells are not new. They were first discovered in 1839. There have been many breakthroughs since then but the advancements are getting smaller. In Europe, large solar plants cover 1000’s of acres and have for years. There may be a company or university that claim to be on the verge of a breakthrough but there always will be. If you put money down on a solar system today, your ROI will be the same today as tomorrow, a year from now, or ten years from now. Advancement in technology or price in the future will never mean you’ve made a bad investment today in solar technology today. With all the advancements being made we are still using silicon crystal which is a very old technology. We have found ways to make them cheaper and a bit more efficient but they are still made out of sand. We are pleased to report that finally after 30,000+ installations in Ontario, most insurance companies now understand solar. Most of them now treat solar equipment the same as any other equipment such as a hot tub or upgraded kitchen. Our customers pay from $75 to $150 extra per year to insure their equipment. Check with your insurance company. In the past some of our customers have had to change insurance companies to get reasonable rates but most insurance companies are now on board. My roof has a lot of fancy peaks and strange angles. Is that a problem? It certainly makes our job more challenging but we can usually find a layout that will work with most rooftops. A small older home often has more room for panels than a newer larger one does. A simple roof will be cheaper to have panels installed then a complicated one. What if my shingles aren’t in very good shape? Get them replaced first. Remember that these systems will last 20 to 30 years. If we have to pull them off so that you can replace your shingles, it will be at your expense. If you can’t afford to re-do your entire roof right now, then see if you can just do the area where the panels will sit. How are the panels attached. Will they damage the roof? This is a great question and one that more people need to ask when considering a solar installation. It is a critical part of your system but since it is out of site under the panels, few people give much thought to it. A full size system can mean up to 90 roof penetrations and it is imperative that every one of them be leak free for the life of your system. An inexpensive system like butyl tape which can be seen in this video does not meet the requirements of the building code, will invalidate your roof warranty and will eventually leak. At the other end of the scale is the PV Quickmount system. It is probably the most expensive mounting system out there but it is also the best. It is all aluminium and stainless steel and even though it costs $1,500 more than the cheaper ones, we feel it is money well spent. We are in business for the long term and we simply cannot afford the risk of a leak in your roof. Will my roof handle the weight of these solar panels? Very likely. The weight of the solar panels and mounting system adds less than 3 pounds per square foot, which is pretty low when you think about it. A good quality layer of asphalt shingles weighs 2.75 pounds per square foot. If your roof is still standing after the ice storms of the past winters than you roof will be fine with solar panels. From a global warming perspective, does it make sense to cut down trees that might shade my solar array? Don’t trees help reduce global warming? This is a great question, and a complicated one. Trees reduce carbon in the atmosphere by building plant tissue out of it and locking the carbon away. Unfortunately this is only temporary, when the tree dies and is burned or rots, the carbon is released back into the atmosphere. Solar panels reduce carbon in the atmosphere permanently by generating power that would have been generated by fossil fuels. Let’s put it into perspective. An average tree in the Canadian climate will temporarily reduce carbon in the atmosphere at the rate of about 20kgs of carbon per year. An average 10Kw solar array will permanently reduce the amount of carbon in the atmosphere by about 15,000kgs per year. We like trees too but when it comes to carbon there is no contest. What if my neighbors are jealous? They probably will be. Sorry, we can’t help with that. You will be the greenest on the block, even greener than that guy with his Prius. Can I convert my microFIT system to a net-metering system in the future? Yes and we believe this is going to happen with the majority of microFIT systems under versions 3 and 4 rates. Once hydro rates exceed the microFIT rate than there would be no reason not to do this. So I can only install 10kW of solar in Ontario? Not exactly. You can install as much solar as you want but you can only put 10kW back into the grid at any time. How does snow affect the panels? If the panels are covered with snow, their output will be seriously diminished. Fortunately most of our annual sun hours occur during the summer so losing January is not going to have a big impact on your annual production. Also if it is cold enough the wind will often blow the snow off and if it is warm enough it can melt off. If you have a low roof it may be practical to clear the snow with a roof rake but it isn’t strictly necessary and most people don’t clear them. How much would it cost to convert a microFIT to a net-metering system? Is the equipment compatible? The equipment for a microFIT system is exactly the same as it is for net-metering systems. The only difference is how it is connected to the grid. The cost to convert will mostly depend on the utility and the ESA. It could be as low as $500 or as high as $3,000. We have never had to do one yet but our best estimate would be about $1,500. Under net-metering rules do I get credit for the higher time of use rate? No but you also will not need to worry when you use power. When you install a net-metering system you will automatically be removed from the time-of-use billing which most utilities will. Most people will benefit from lower bills by this change alone. Also, you won’t have to wait until midnight anymore to start the dryer. I heard that some people installed solar systems and then were denied a connection. Is this true? This can happen if the rules and procedures are not followed carefully. To be safe, we wait for approvals from your local hydro company before proceeding with any work. Should we fail to receive approval and have to cancel your project, then we will return your deposit in full. Can I have both a microFIT and a net-metering on the same property? Yes most utilities have accepted this as being an option for you if you already have a microFIT system installed. We have installed dual systems with Halton Hills Hydro, Milton Hydro, Hydro One and many others. The only exception we have found so far is Oakville Hydro and we are working with their legal department to change this. I’m sick and tired of my utility and just want to cut the cord. Can you help me? With the high electricty rates and the lack of customer service from the utilities we get this call alot. The answer is, Yes we can, but you probably don’t really want to do that. We all want to be independant of the monopolistic utilities but it does come at a price. From a return on investment standpoint the net-metering option is a much better choice. You still get to generate all of your own power but you don’t need to worry about cost and complexity of batteries and generators. Give us a call and we can go over the pros and cons.